HP has announced an absolute plethora of new products today, including – by our count, at least – four new Ultrabooks. And TechRadar was on hand to get up close and personal with the pick of the bunch – the HP Envy Spectre XT. The follow up to the company's original Ultrabook contender – the HP Envy 14 Spectre – the HP Envy Spectre XT shaves off over 5mm in thickness from the older version, coming in at an Acer Aspire S5-esque 14.5mm. And the slimmer waistline makes all the difference, the XT is a gorgeous looking machine that quite rightly stole much of the attention at the HP event we attended in Shanghai. Described by its makers as an "ultramobile premium Ultrabook", the Spectre XT weighs 1.4kg. It certainly isn't the lightest Ultrabook that we've handled, but it's far from being heavy. 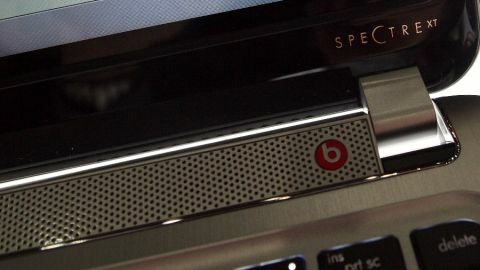 This being HP, Beats Audio is on board – complete with quad speakers. Unfortunately, due to the booming noises inside the Shaghai Expo Centre, we couldn't fully gauge the quality but it sounded loud enough. The 13.3-inch HD screen held up pretty well under the hall lights, and surprisingly wasn't covered by smears and fingerprints, despite the array of global tech hacks giving it a quick fondle. Boot up time from sleep was more or less instantaneous, due to the latest generation Intel Core processor on board combined with Intel's Rapid Start Technology. Other notable hardware inclusions are its 256GB mSATA SSD, an HP TrueVision HD Webcam, and Gigabit Ethernet, Wi-Fi, USB 3.0 and HDMI. You can expect a battery life of around 8 hours. ...while the other side features the headphone jack, a further USB and an SD card slot. The trackpad is a good size and seemed perfectly usable to us, while the isolation keyboard is remarkably similar to that on a MacBook Air. As you can see, there's a Beats Audio speaker at the top of the keyboard where the power button is also located. The HP Envy Spectre XT will come pre-loaded with full versions of Adobe Photoshop Elements 10 and Adobe Premiere Elements 10 - it looks as if HP is taking a leaf out of Apple's book too by offering an "experience" rather than just a product. If you fork out for an XT you'll also get access to a concierge phone line for technical support dedicated exclusively to HP Spectre users. But it's the design that really makes the HP Spectre XT stand out from the ever expanding Ultrabook clan. Its brushed-aluminium chassis looks superb and the svelte bezel helps to create an illusion of a notebook much smaller than its 13.3 inches. Out in June, the HP Envy Spectre XT will be joined by a Pro version – one that offers Windows 7 Professional and TPM security. Prices are expected to from £899.